The way customers shop and pay is changing rapidly. Research tells us that more than 50% of consumers in the 18 to 24 year old age bracket are using new technology-enabled payment tools. And that number is growing rapidly across all age groups. Somerzby knows that you want convenient payment options when you shop online. Our customers have told us that extortionate credit card interest charges, hidden fees for payment processing, and complex hire purchase agreements are no longer the payment options of choice. You want to shop online and purchase with assurance that your financial transactions are secure, private, and don’t hold any nasty hidden surprises. We’ve listened to what you have been telling us and we’re proud to offer a payment option that will really tick all the boxes: zipPay. zipPay gives you everything you’ve ever wanted in a payment platform including flexible repayments, zero interest, and zero monthly fees if you pay your monthly account in full. Whether you need a cat scratching post or a dog bed as a last-minute gift for a friend or you’ve been planning your rabbit hutch purchase for weeks, zipPay makes your Somerzby shopping experience even easier. zipPay is an amazing digital wallet that gives you up to $1,000 instant credit and makes your online purchase or in-store shopping a breeze. But unlike credit cards, zipPay doesn’t load you up with crippling interest rates and charges. You simply make your purchases and then choose your repayment options. zipPay is the perfect way to shop for all your pet supplies at Somerzby. Simply choose zipPay as your payment option at checkout—it couldn’t be easier. zipPay pays the merchant and you can pay us back later. zipPay allows you to set up automatic repayments from your nominated accounts making repayment hassle-free. Pay your monthly account in full and you pay absolutely no additional fees. It’s so easy to join zipPay too—simply sign up on your mobile with an email or social account. zipPay will run a few checks to verify your identity and in most cases acceptance is almost instant. You can log on to your zipPay account at any time to track all your purchases and payment history. And you can have the confidence knowing that zipPay is an Australian company with customer care representatives based in Sydney. Why is zipPay perfect for online shopping? Online shopping is all about convenience and zipPay is the perfect partner for getting all your Somerzby special pet needs when you need them. Maybe you’re looking to buy a Homestead large chicken coop and run or an extra large double dog kennel but you can’t fit it in the car. It’s so much easier to simply go online, zipPay your purchases and have them delivered to your door. You know those hectic days when you’ve managed to get home in one piece with all the shopping only to find you’ve forgotten the collapsible pet crate. You need it next weekend—no worries—use zipPay online and problem solved. zipPay protects your financial details–Every time you give your personal banking information to an online store you potentially expose yourself to hackers and financial scams. With zipPay your financial details will never be exposed to an online store or sales staff ever again. You’ll have up to 60 days before any monthly fees are charged to your account. Somerzby is absolutely committed to making your shopping experience easy, safe, and convenient. 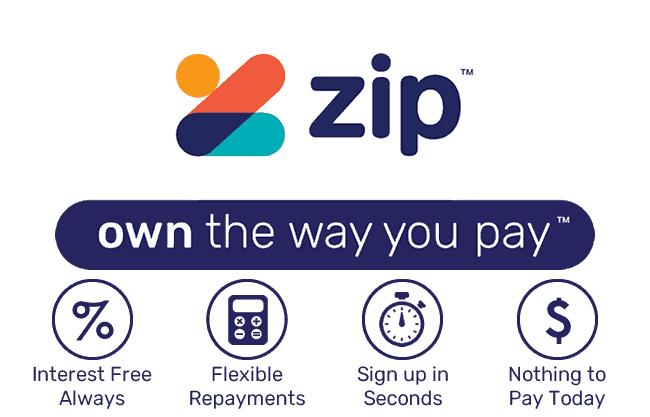 zipPay really is the perfect way to buy now, pay later. zipPay is completely transparent about its zero fees policy. You simply need to pay the minimum of $40 on your monthly account. Pay your account balances in full each month and you’ll enjoy zero monthly account fees. In fact, you can get up to 60 days fees-free on your account (depending on when you make your purchases). You can choose to make the regular scheduled payments automatically or you can make additional manual payments without affecting the auto-payment schedule. Total flexibility–it’s all in your hands. $1 pre-authorisation charge when you first add a card. This is not actually a charge and it will disappear from your statement. zipPay knows that sometimes your purchases are not quite what you wanted. zipPay works with merchants to ensure that the refund process is swift and painless. Somerzby offer a 30 days money-back guarantee on all our products. If, for any reason, you’re not happy with your purchase return the goods to us in good condition (in the original packaging) within 30 days and we will gladly refund the full purchase price minus the cost of delivery. Once we have received the goods we simply instruct zipPay to refund any money you have paid back to your account. The funds should appear in your account within 48 hours. Somerzby is a respected online and in-store merchant and your financial security is very important to us. We recommend zipPay as a payment platform because of its hi-tech security features and commitment to safeguarding customers’ financial and personal details. zipPay gives you the assurance that your financial details and your personal information are protected by the highest level of security. zipPay means you can buy all your Somerzby pet needs from the convenience of your home with real peace of mind. This entry was posted in Chickens and tagged easy, flexible payments, interest free payments, zippay.